Trainer Bob Harper discusses many healthy habits in his latest book The Skinny Rules, and one of them is: don't fear fish. This nutritious lean protein makes for a perfect dish if you're looking to lose or maintain your weight. Best of all, it's easy to prepare. 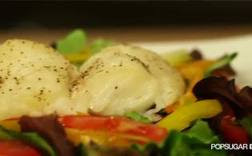 Watch this video to learn Bob's simple technique for cooking fish that keeps the calories down, but the flavor profile high.